In our every busy lives it is common that we often short-circuit our evaluation of situations because the cost of a complex and thoughtful decision may outweigh the negative consequences of making a mistake or simply the thinking required may not be time affordable given all the other burdens we may have. Many have observed this shortcut decision-making pattern and determined while the blink of an eye decision can be “good enough” it also can be exploited. The legitimate marketer may appropriately influence with copy, imagery, offers to improve a conversion rate. An unscrupulous ponzi schemer or conman may go quite a bit further in their persuasion in service of some nefarious end. Whatever the aim what we are talking about the psychology of persuasion and influence and there has been much said about it over the years. Probably the most influential person in this space is Robert Cialdini whose book Influence: The Psychology of Persuasion is widely cited. Looking over Cialdini’s Six Weapons of Influence summarized on WikiPedia we see that many are being exploited online and some cases quite a bit, particularly right now in the social media space. The most obvious weapon of influence being used in social media marketing right now seems by simple inspection to be social proof. The basic idea of social proof is that decision making, particularly the short-cut kind, may be significantly influenced by the choices made by other people. You might assume that other people spent time evaluation a decision and therefore that decision is sound, this then allows you to make a fast cut decision. This is where people flock to the most downloaded or the highest rate or whatever social indicator suggests that the masses dub the choice as safe or even optimal. There are always exceptions but these rules of thumb are clear. People know it and they combat it, it is why you see restaurant owners making sure to fill the window and close to the door seats first, why people “salt” the tip jar with bills and coins. 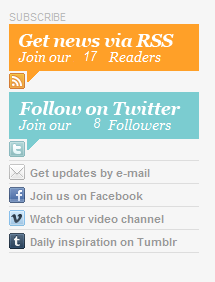 So here we see a standard subscribe panel on some site, not much social proof encouragement here. Of course, we could let people know that they will be joining with many other smart people who had good reason to subscribe. But then again if we didn’t have very many subscribers this might backfire. What would think if you saw this instead. Not so popular? Maybe move along. Hmmm…maybe we want to salt the jar then! (We aren’t saying that example did by the way). However, the need to look popular probably explains why folks think it is useful or legitimate to have fake (or pointless) Twitter followers. 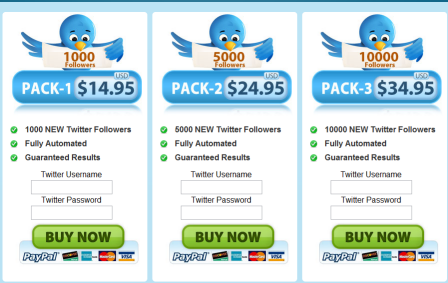 Buy your way to follow popularity!? Buy a bunch of followers and you look legit for the next one who comes along! Are these next users going to do the work to tell it is just a bunch of trash accounts? Apparently there is quite a market for this service take a look a the PPC that comes up from queries like http://www.google.com/search?hl=en&q=twitter+followers&aq=f&aqi=g10&aql=&oq= If they are doing all new accounts, swapping accounts with participants or just playing the follow-you/follow-me game it is unclear (that by the way is reciprocation one of Cialdini’s Six Weapons at work), but the goal is clear – look more popular. Call it the “don’t be the first person at the party” syndrome, but lots of people just aren’t willing to take the plunge on some unknown until they see others have. No time to look it over carefully, better to trust the masses. If they haven’t gone there it isn’t good, but if they apparently have then indeed this YouTube video is a riot? Internet rigging online is certainly not new. Hit counters a decade ago routinely were set to look as if 1000s of visitors had come to the site when they hadn’t. Software download sites have fake downloading (most seem to use some bot at our sister software company we’ve caught them red-handed over and over). Many product, e-commerce and content sites even have fake reviews. Occasionally the rigging parties are unmasked (example) and the scheme is openly discussed and sometimes combated (example). However, many turn a blind eye to the manipulation. However, you may now start to understand why some folks on Amazon have literally 100s of long reviews (nearly all 4 or 5 stars) to their names. Many make money doing it! Social proof based influence schemes are alive and well online as they should be, the online world is not just a reflection of the real world, it is the real world. So in conclusion, remember what your mother likely told you when you were small, “Just because everyone is doing it, doesn’t mean you should”! Mom’s advice whether Internet-focused or not works just fine.